I made scones last week for Mother's Day and they came out pretty well as a first attempt. I used a basic biscuit recipe of 3 parts flour to 1 part fat to 2 parts liquid. 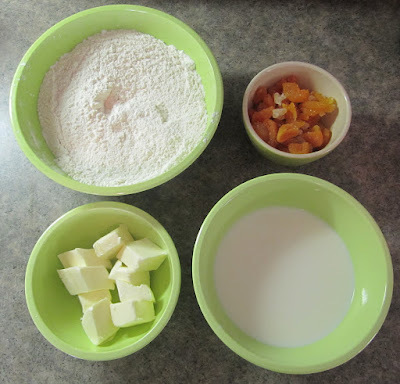 I added some sugar to the dry ingredients to sweeten it up and a bit of baking powder. I made two different types of scones. The beauty of scones is that the basic dough recipe is the same and you can simply mix in the flavors you want to incorporate. 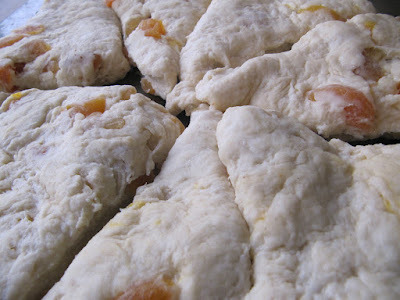 First up: apricot ginger scones. I combined flour and butter until there was a coarse grainy consistency. I then poured in the milk and mixed and stop right when it all came together. I then folded in a combination of chopped dried apricots and candied ginger. I rolled up the dough and placed it on a baking sheet. 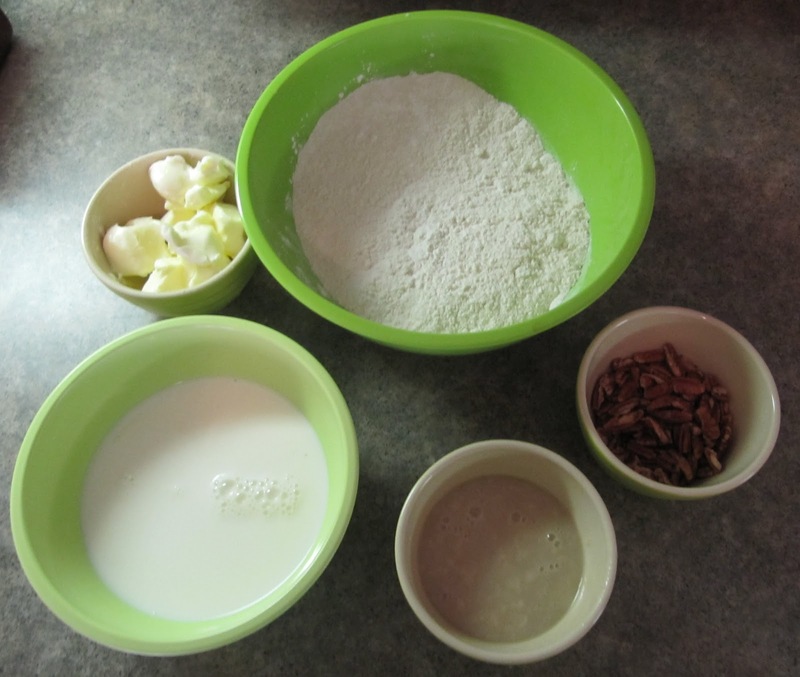 I cut the dough into large triangles, I kept them close together on the baking sheet. Not too sure of the technique hear but I'm always told that it is best to have them touch a bit. The scones came out great, not bad for a first attempt. Keeping the ratio consistent seems to be the key. 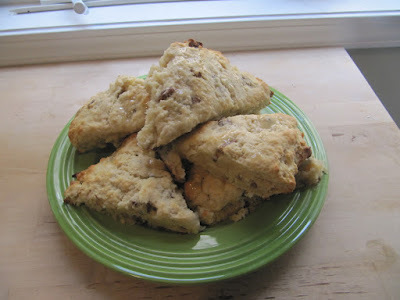 I rather enjoyed this scone but I wish I had sweetened it up a bit more. I followed a similar process for pecan and salted caramel scones. I made a caramel sauce by first boiling sugar and a bit of water until the sugar darkened a little. I added some canela during the process to add an additional cinnamon flavor. Once the sugar was at the appropriate temperature, I took it off the burner and added a few nubs of butter and some cream. I added some ground sea salt to the mix. 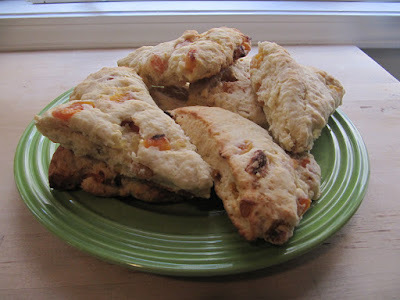 I followed the same dough recipe as the apricot scones except with pecans and a bit of the caramel sauce mixed in. I initally had hope to get solid bits of caramel, but I added too much liquid leaving me more with a sauce. It was still rather tasty so along with incorporating a bit into the dough I drizzled over the finished scones for additional sweetness. It was pretty fun to put together the scones. The process went along more smoothly than I had first anticipated, I will definitely be trying out different varieties of this. These scones were a crowd pleaser making my mom and two sisters-in-law more than happy to enjoy them on their special day. When are you inviting me over to eat these?! They look incredible, Daniel! You have such a gift.